PITTSBURGH -- North Carolina State was down, but not out. The Wolfpack, needing a win to keep pace in the tightly packed Atlantic Coast Conference, spent most of Wednesday trailing by double digits against a Pittsburgh team that is winless in conference play. Pitt was leading by nine points with 5:54 remaining when NC State went on a 13-0 run to turn the deficit into a narrow lead. Torin Dorn had four of his 12 points during the late run and said the Wolfpack never stopped believing in themselves despite trailing. "We never quit on anything until the clock goes zero," Dorn said. If there is time on the clock, we always think we can win. We play fast enough that we can hit four 3s in a row and cut a 12-point lead and tie the game up really fast." 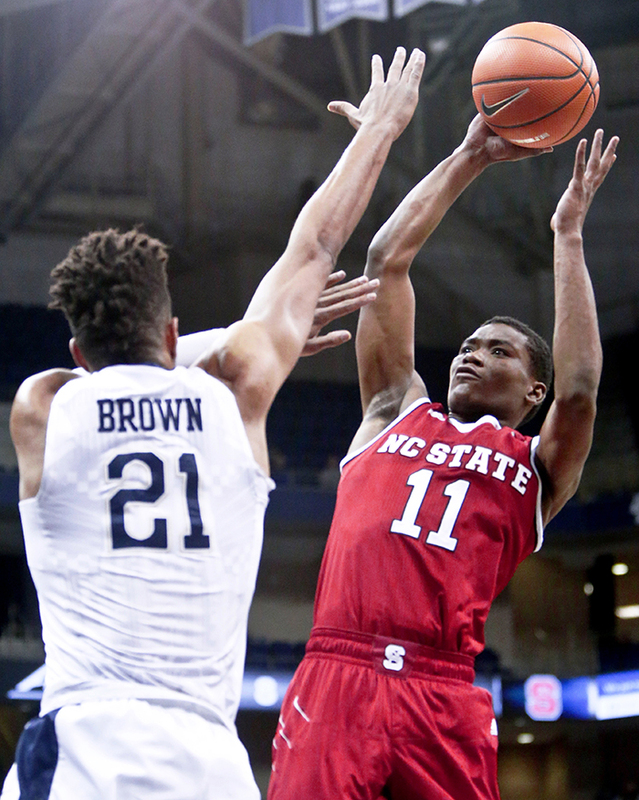 That belief was being reinforced by head coach Kevin Keatts, who wanted the Wolfpack to keep shooting open shots over the Pitt zone, despite a 34 percent conversion rate from the floor that tied a season low. 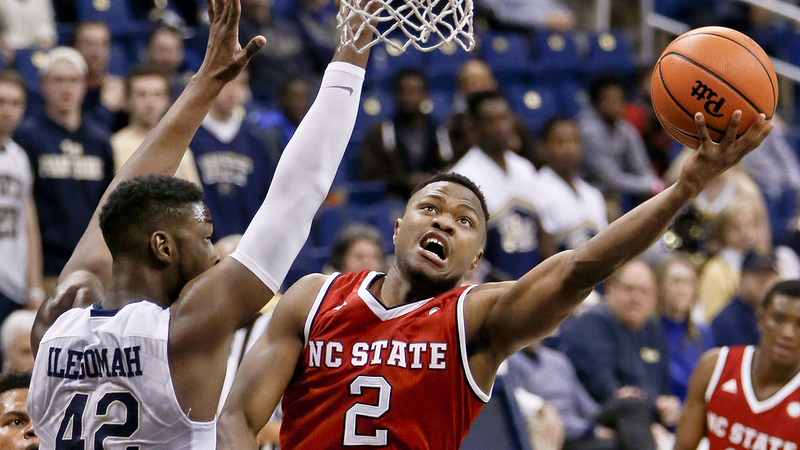 North Carolina State's Markell Johnson shoots over Pittsburgh's Terrell Brown. Johnson had a team-high 12 assists. "One thing I told our guys was if you continue to stay the course and continue to take the good shots and obviously, start defending in the second half and not putting them on the free-throw line, I thought we could win the game," Keatts said. NC State (14-7, 4-4 ACC) started the game with a 17-6 lead, which prompted Pitt head coach Kevin Stallings to switch to a 2-3 zone defense. The change paid immediate dividends as Pitt went on an 18-3 run. For Pitt, (8-13, 0-8 ACC) Jared Wilson-Frame shot 7 of 14 for a career-high 22 points. The Panthers used dribble penetration to get the Wolfpack defense moving and also got both starting NC State big men in early foul trouble. Pitt had a halftime lead for the first time since Dec. 19 against Delaware State and had yet to have a double-digit lead at any point through seven ACC games. NC State: The Wolpack victory will help them keep their heads above water in a deep middle of the pack in the ACC. Seven different teams entered play Wednesday with three conference wins. The top nine teams get a crucial bye in the ACC Tournament. NC State started the day 11th. Pitt: The Panthers are still searching for their first ACC victory this season and have lost 12 straight ACC regular-season games, dating back to Feb. 18, 2017. The four-point loss was the first single-digit deficit for the Panthers in conference play this season. NC State big man Omer Yurtseven was coming off a career-high 29 points against Clemson on Jan. 11, but was held to a more typical performance against Pitt. Yurtseven was 6 of 7 from the field and had 16 points, but played limited minutes because of foul trouble. He collected his third personal in the first minute of the second half, but avoided taking another. Wilson-Frame thought he should have been more aggressive in attacking Yurtseven. "I think it was something I shied away from and as a result, some of the other guys played into that," Wilson-Frame said. Yurtseven was 4 for 4 from the free-throw line as part of a perfect 15-for-15 night from the stripe for the Wolfpack. NC State: Visits cross-town rival North Carolina on Saturday. The Wolfpack have lost their last four games against the No. 10 Tar Heels by an average margin of 24.8 points. Pitt: Remains home to host Syracuse on Saturday. The Panthers have won 9 of 11 against the Orange since the Petersen Events Center opened in 2002.